Provide comfort for the family of Myron Thompson with a meaningful gesture of sympathy. 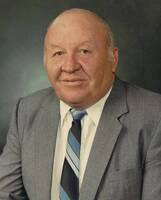 Mr. Myron D. Thompson passed away on Saturday, January 5, 2019 at the age of 82 years. Arrangements in care of Heartland Funeral Services, 5226 - 46 Street, Olds, Alberta. To send flowers in memory of Myron D. Thompson, please visit our Heartfelt Sympathies Store. We encourage you to share your most beloved memories of Myron here, so that the family and other loved ones can always see it. You can upload cherished photographs, or share your favorite stories, and can even comment on those shared by others. Shannon Stubbs & Shayne Saskiw and The Conservative Party of Canada have sent flowers to the family of Myron D. Thompson. Thinking of you Dot, and fondly remembering your and Myron's coffee visits in Hussar. Thanks too for the many years of service to our country. Myron was a good man. We want to extend our deepest sympathy, Myron was someone who played a big role in our lives and someone who was always committed to the community. As a young person going to school in sundre and growing up in sundre, Myron was such a big influence and his patience and support helped shape the people we are today. He will be missed, but he will not be forgotten. A great person and a pillar of the community. Sad news for so many of us. All the best to Dot and the family. Ron and Angie Dube. Hi Dot - So very sorry to hear of Myron's passing. Have very fond memories working with Myron on his election campaign's. A very good, hardworking and honest man who carried those abilities into the political arena. Appreciate that he always called it as he saw it, direct and to the point. There are virtually only a handful of politicians today that have that quality. Ralph Klein had that same qualities. Always remember giving Myron that "B.S. button" for his Ottawa office - I"m sure he was able to use it often !!. Please take care of yourself Dot. Maybe we will see each other sometime down here in Airdrie.